Real estate investing has never been as accessible as it is today. If you are looking for a way to generate semi-passive or passive income, you should consider real estate. As you know, the traditional way to become an investor in real estate is to purchase a property. But nowadays, you can also resort to a Real Estate Investment Trust (REIT), an investment fund that collects money from multiple inventors to operate real estate and redistributes the resulting income. The main advantage of REITs is that you can start investing without shelling out huge sums. Thanks to the proliferation of mobile applications in recent years, you can find apps that cater to real estate investors. If that sounds exciting to you, check out this list of nine real estate investing apps that help you build and manage your investment portfolios from your smartphone anywhere, anytime. This app is more directed towards people who are new to real estate investing. When you sign up for Stash you receive a $5 bonus. The first month is free, after which you will have to pay a monthly fee of $1 or 0.25% per year for accounts greater than $5,000. No minimum balance is required, and you can withdraw funds anytime without being charged. Stash comes with educational material and helps you build your portfolio step by step. Note that you can also get a prediction of the potential returns if you put more money in a portfolio. Stash gives you access to various Exchange-Traded Funds (ETFs) related to the real estate industry, such as Real Estate Tycoon, Roll with Buffet, or Slow & Steady. This way you won’t feel confused and overwhelmed by all the ETFs names you are not familiar with. However, the management of the ETFs you purchase requires a fee separate from what you pay Stash. If you want a beginner-friendly tool to start investing in the real estate industry and don’t know where to begin, Stash is for you. Click here to sign up for Stash, get your $5 reward, and start investing on a low budget! Fundrise is one of the most widely used real estate investing apps. Fundrise uses the term “eREIT” to denote its REITs, highlighting their online nature. You can get started with Fundrise with as little as $500 of investment for the Starter Portfolio. If you are wondering what the cost of using Fundrise is, users pay a 0.85% management fee per year management and an additional 0.15% advisory fee. However, be aware that there might be some other fees. If you are not satisfied with how Fundrise works, you can get your money back within the 90 first days. One of the biggest selling points of Fundrise is the full transparency granted to users. You can see pictures of the real estate you invest in, its location, as well as the risk involved, and key deal points that detail why a given property was chosen. This way, you have a clear picture of your entire portfolio at all times. That said, one thing you should be aware of is that you don’t have control over what to invest in. Fundrise has a team that identifies, acquires, and manages assets on your behalf. This platform works best for investors who will keep their funds for the long term – five years or more. In fact, there is an exit fee for those who want to withdraw their funds before five years have passed. If you want to learn more about Fundrise, take a look at our in-depth review. Click here to sign up for Fundrise and start building your portfolio today. Another real estate investing app worth looking into is Roofstock. Roofstock focuses entirely on the single-family rental sector, bringing buyers, owners, and sellers of rental homes in one marketplace. Anyone can sign up and start looking for properties on the go; there is no fee for registering or restricted member access. The biggest advantage of Roofstock is the extensive amount of information made available to help investors make informed decisions. Properties are thoroughly inspected and evaluated before listing. A detailed report is available to potential buyers, with information on items that may need maintenance as well as tenants if there are any. You can visualize estimates of costs and returns, and consult lease terms as well as payment and tenant history. On top of that, you can see pictures, floor plans, a curb view, and even a 3D model and 3D tour of the property you’re interested in. Roofstock also provides insight on the neighborhood in which a property is located. As all real estate investors know, the characteristics of a neighborhood affect the investment appeal of a property. Neighborhoods are rated on criteria like median home value, median income, employment rate, the percentage of owner-occupied homes, and the average school quality. Roofstock charges sellers a 2.5% commission when a deal closes, with a minimum of $500. This commission rate is lower than what most real estate agents would charge and is another feature praised by many users. But remember that you need to set aside an emergency fund for urgent repairs and expenses like maintenance and vacancies. It’s also important to note that Roofstock provides homeowners with property management services and continued support while they earn income from rental. Click here to sign up for Roofstock and find the perfect rental home to invest in. Airbnb real estate investing can be a worthwhile option for homeowners who happen to live in good touristic spots. As you probably already know, Airbnb is a platform that allows homeowners to list their property, or part of their property, to short-term guests and travelers. But keep in mind that Airbnb guests expect a certain level of hospitality from their hosts, so this is not exactly a passive income business model. You can hire a property manager dedicated to Airbnb properties to take care of the process, but you will have to pay them. You need to take good care of guests so that they will leave favorable reviews, which in turn will attract even more guests. When it comes to the Airbnb mobile application, it has most of the features of the desktop platform with the added convenience of accessing it from your phone. Sometimes users complain about less-than-stellar user experience, but the application still remains widely used (282K+ on Apple Store and 464K+ on Google Play). If you live in an area that attracts lots of tourists, and you can rent your property or part of it, then Airbnb can be a good fit for your real estate investing business, especially if you enjoy meeting and interacting with new people. Click here to learn how much Airbnb hosts in your area can make. Another alternative worth considering is Ally Invest. As a beginner, starting with Ally Invest is a good choice since there is no account minimum and the flat rate of $4.95 charged for stocks, ETFs, and options is quite low compared to other alternatives like E-Trade. There is also an education center where you have access to plenty of material on investments, investing styles, and terms related to investing. Like other platforms, you can use Ally Invest to find and invest in various REITs. The Ally Invest mobile application covers the most essential functions such as trading, monitoring investments, viewing watch lists, and more. It should be noted that the app doesn’t feature market news or the streaming of financial news. But if you don’t need the bells and whistles, and are looking for a simple app with a clean interface, Ally Invest might just be what you’re looking for. Click here to sign up for Ally Invest, open a FREE account, and start investing in REITs! Simply put, Zillow is one of the most popular real estate investing platforms around. The mobile platform is easy to use and allows you to quickly search homes in your area of choice (you can use GPS), with custom filters like listing type, home type, price, number of bedrooms, and more. One of Zillow’s unique features is the access to pre-foreclosures, foreclosure auctions, and banked-owned properties. There are also the “Zestimates”, the home value estimates generated by an algorithm that uses both public and user-submitted data. While they are not always as accurate as a regular home appraisal, Zestimates are very popular with Zillow users. You will also receive email notifications on homes you are interested in, with updates on price changes and open house dates. And while the neighborhood data is not the most accurate, you still get a general idea of a home’s location via graphic maps and satellite overlays. Because of all these features and advantages, the Zillow app is definitely worth a try. Click here to register with Zillow and start looking for real estate investment opportunities. LoopNet is said to be the best platform for investors looking for multi-unit or commercial properties like office buildings. Opportunities related to this type of real estate can be hard to find on other platforms, and LoopNet fills that gap. The mobile application allows you to use all the features found on the website, but to access them all, you need to sign up for a premium membership. That said, the free version covers the most basic functions and lets you search commercial properties. Using search filters is intuitive, and you get detailed information on properties including data, photos, location maps, street view, and more. You can also display search results either on a map, a list, or both. And if you don’t want to miss new listings that match what you’re looking for, you can easily set up notifications. Click here to sign up for LoopNet if you are targeting the commercial real estate market. This real estate investing platform provides you with a large database of MLS real estate listings to make your search easy and time-efficient. As you would expect, Redfin includes common features like notifications, saving favorites, and customizable searches. The 3D walkthrough feature gives you an immersive virtual tour of the homes you’re interested in. Another interesting feature is the option to book tours with a local Redfin agent. Not only that, but you can read comments from Redfin agents on homes they toured. You might not find similar information on another platform about the same property. To help users make more informed and timely decisions, Redfin identifies which homes are likely to sell fast, calling them “Hot Homes”. The algorithm for Hot Homes uses information like price, property type, buyer preferences, and more to calculate the likelihood of a home to sell quickly. If you sell your home through Redfin, you will be charged 1.5%, which Redfin claims to be lower than the average rates. Click here to sign up for Redfin and find the best homes in your area. 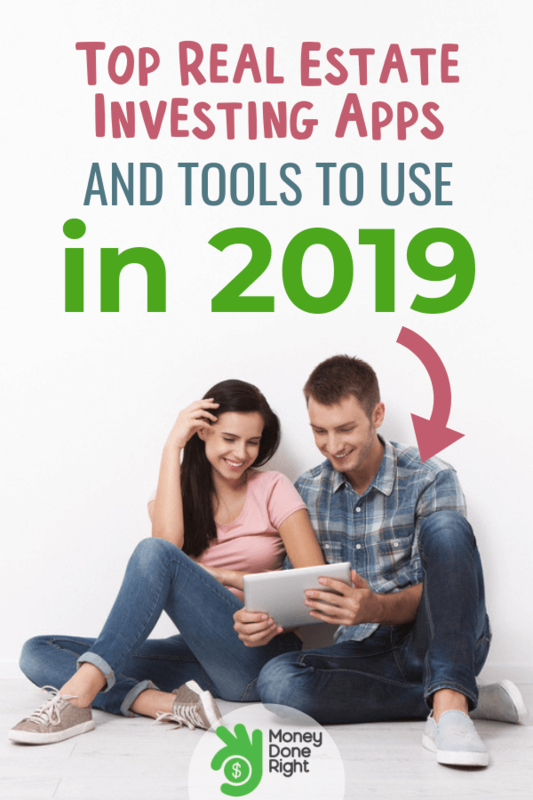 The last app in this list is not specifically made for real estate investors, but many of them use it in their business thanks to how convenient it is. As the name indicates, DocuSign takes away the pain of dealing with lots of paperwork as you close contracts. Designed for all kinds of organizations and users, DocuSign is the most popular e-signature solution. You can upload documents, email them, and specify where signatures should be added, as well as the order in which to sign. Moreover, you can easily find proposal templates for the real estate industry, which you can edit to your liking. Click here to start using DocuSign and save time and effort while you make deals. Today’s technology provides real estate investors with plenty of apps and tools to run their business and make a profit in a smooth and efficient manner. People who are new to online real estate investing can now break into the industry with and work their way up more easier before. Not only there is a lot of material available to increase your knowledge, but most real estate investing apps and platforms are also user-friendly and continually being improved upon. Because of the diversity of apps at hand, you should take your time and review your goals so that you figure out which ones suit you the most. Be sure to weigh the pros and cons of each app to make the right choice and make your real estate venture a success. For more useful tips on real estate investing and the best real estate investing apps you should use, click here! What real estate apps are you using? Which ones would you recommend?